This year, April 2nd is Equal Pay Day in the United States. In other words, the average woman would have had to work until today to earn the same amount of men earned in 2018. Although the wage gap has shrunk over the years, pay inequality still remains a present issue in the country today. 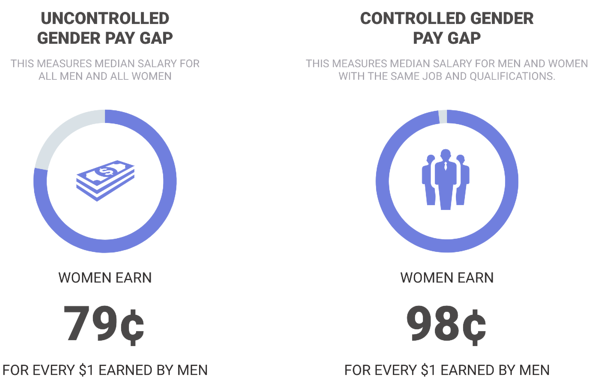 To explore the current state of pay inequality, Owl Labs conducted a study analyzing the wage gap between men and women and also explored if remote work opportunities had an effect on pay equity between genders. Owl Labs’ findings showed that despite advancements towards pay equality, the pay gap is still very much present in today’s workforce. 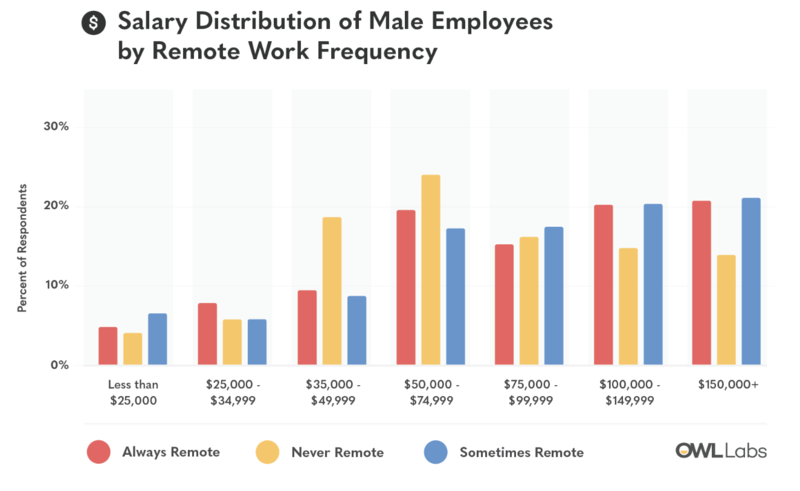 Looking at salary ranges by men, we see that most report making between $50-$75k, with increased earning potential for men that choose to work remote full-time or on occasion. However, this trend is not as pronounced for women. Regardless of their working style, the salary ranges for women follow a bell curve distribution. While we do see earning potential rise for women who choose remote working options, we see significantly fewer earning higher wages than men reported. To better illustrate the prominent wage gap as it pertains to making higher salaries, Owl Labs used an additional chart zeroing in on employees that reported making $100,000 or more annually. Clearly, the “glass ceiling” phenomenon still persists. 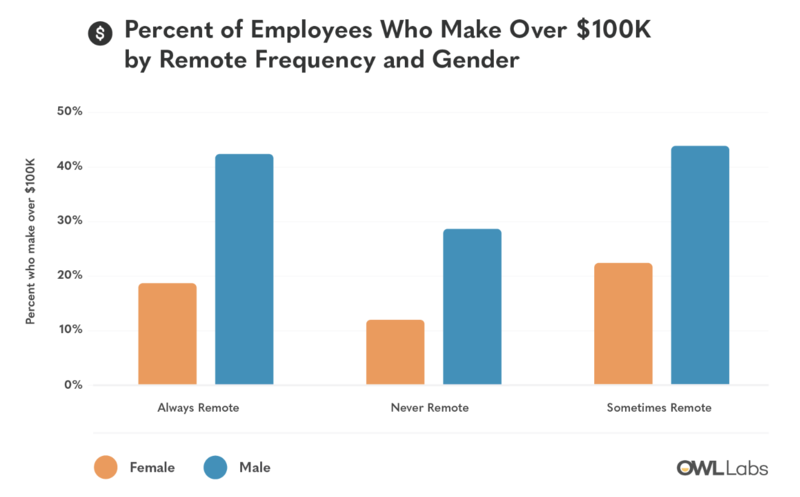 While employees who reported working “sometimes remote” had the highest salaries across the board, there is still a huge discrepancy between genders. It’s possible that we see the huge spike in salaries for hybrid workers (those that work in an office, but sometimes work from home), is because working from home is often used as a benefit for top performers, thus their higher wages. Even still, the wage gap is still present in these instances. Not only do we see a prominent gap for employees making over six figures, we also see the gap widen as employees move up the corporate ladder. The study measured managers making over six figures, and found that not even 20% of female managers earned over $100k annually, regardless of working style. Here, we also see a deviation from the previous trend of remote workers consistently earning higher wages than those who work in-office full-time. 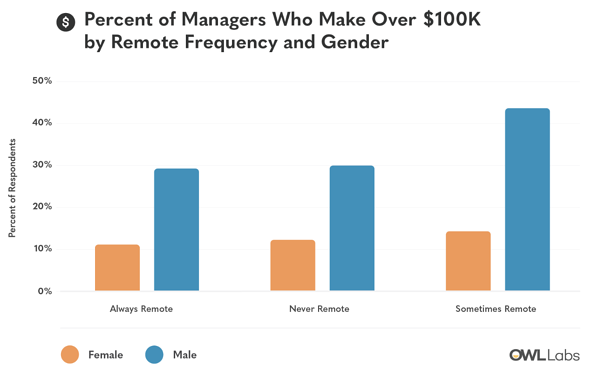 While this trend still remains for men, women who work remotely full-time were 16% less likely to earn $100,000 or more than female managers who never work remotely. In the above charts, we see men and women report higher wages when they “sometimes” work remote, rather than not at all or completely. While we’ve certainly made progress over the years, these findings show that we still have a long way to go towards pay equality. The study also shows that seeking out remote working options (either full-time or companies that offer it as a perk) has higher earning potential across the board. This makes sense, as remote work opens up more options for employees, and those companies will tend to have more access to top-talent candidates. However, women shouldn’t need to seek out remote opportunities to earn the amount they deserve. 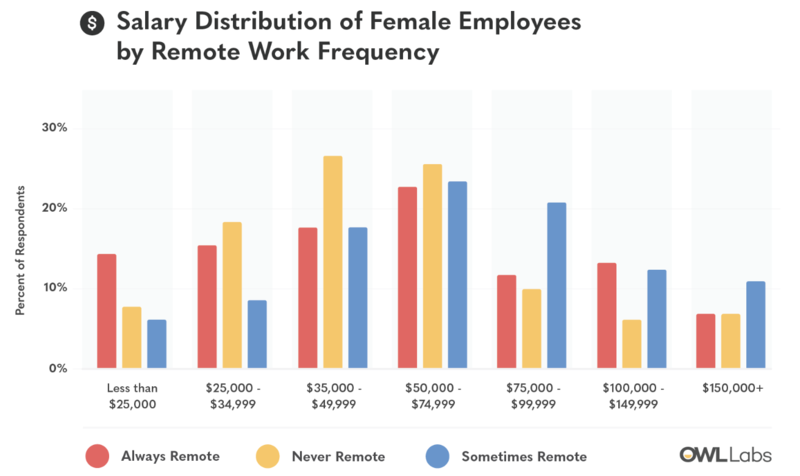 Currently, women make just $0.80 for every dollar a man makes whether they are remote or on-location. PayScale recently published a study analyzing the “uncontrolled” pay gap (median salary across the board between men and women), and the “controlled” gap, which measures men and women with similar job titles and qualifications - and found that women in those roles are still being paid 2% less than their male counterparts. So we can clearly see that even when we have a leveled playing field, it’s still not quite even. 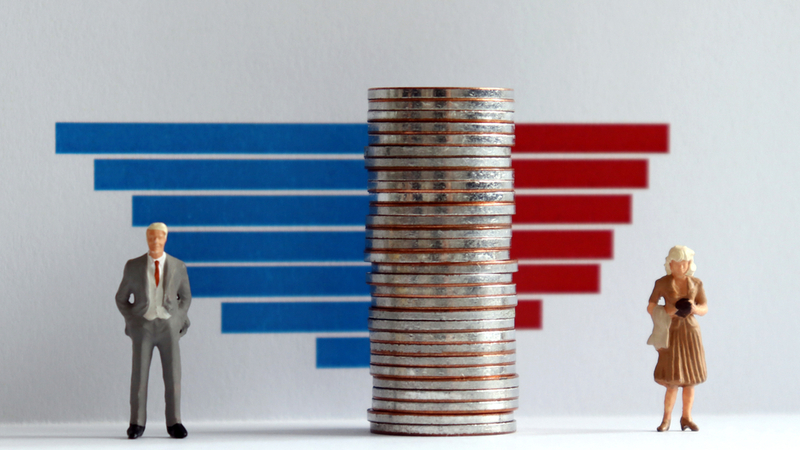 Awareness events like Equal Pay Day are so vital for both employees and their employers to take a step back and recognize this issue, and evaluate what can be done to be a part of the solution. For more data, you can check out the full study from Owl Labs here.